For everyone out there who suffered from sleep deprivation after your bundles of joy arrived, I have found a book for you (and me if only it was out when my kids were babies). Even when my kids were little, Dr. Harvey Karp had published his book The Happiest Baby on the Block and moms everywhere--myself included--rushed out to purchase and work on the section for helping babies sleep. Good news, Dr. Karp has expanded that section into a book filled with not just suggestions and tactics that work, but there's a lot more. You will find some funny anecdotes, tips to help you and some stories to help you understand. 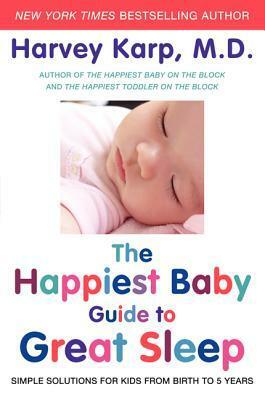 You can read all about The Happiest Baby Guide to Great Sleep at the Harper Collins Website. I'll tell you just the section entited: Stretching Baby's Sleep - Birth to three months would have made a world of difference in my life. I had kids who didn't sleep long. They slept a lot, but in shorter bursts than other kids. This meant I was up more times in the night than many of my friends and it was putting me into a sort of sleep deprivation fog. There's napping tips and the chapters are broken into various ages and stages. I think this should be a book every new mother receives. I hope other moms can apply these tricks and tips and get a little more sleep at night. where was this book when I had my little ones! Thank you for the review, I'll pass it along to my grown children with babies of their own.